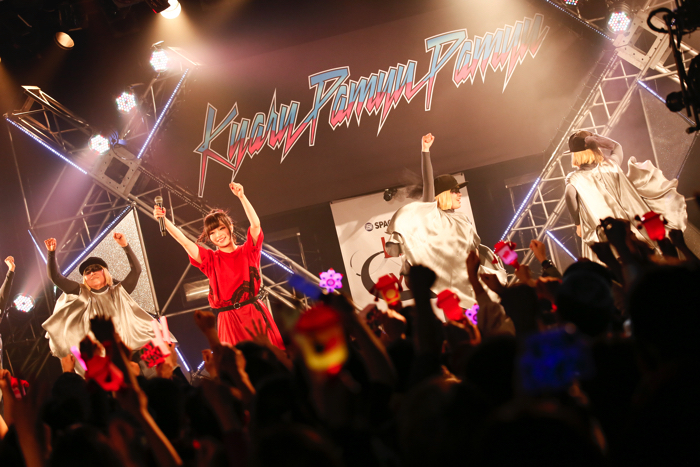 Report on Kyary Pamyu Pamyu’s first live at Ebisu LIQUIDROOM! Japan’s largest music specialized channel, “Space Shower TV’s”premium live program, “SPACE SHOWER TV “LIVE with YOU” did a TV show recording of Kyary Pamyu Pamyu’s Februray 19th (Mon.) live at Ebisu LIQUIDROOM. For the 22nd version of this program, the artist who stood on the stage of Ebisu LIQUIDROOM was none other than the evangelist of Harajuku’s KAWAii culture, Kyary Pamyu Pamyu. The floor of the venue was filled to capacity with an invited in advanced audience. The audience was made up of people of all types and all ages from adults to children who had come with their parents. Some hard-core fans came wearing Kyary’s cosplay. 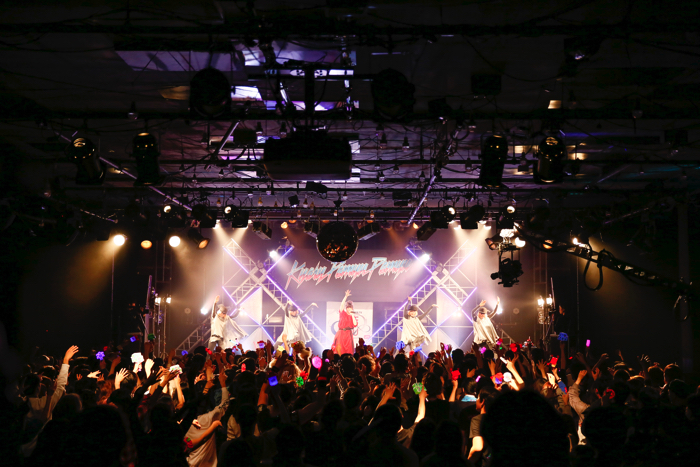 The great variety of the audience make up was proof of the fact that Kyary is a national idol. For the opening set Kyary’s familiar dancers made their appearance. 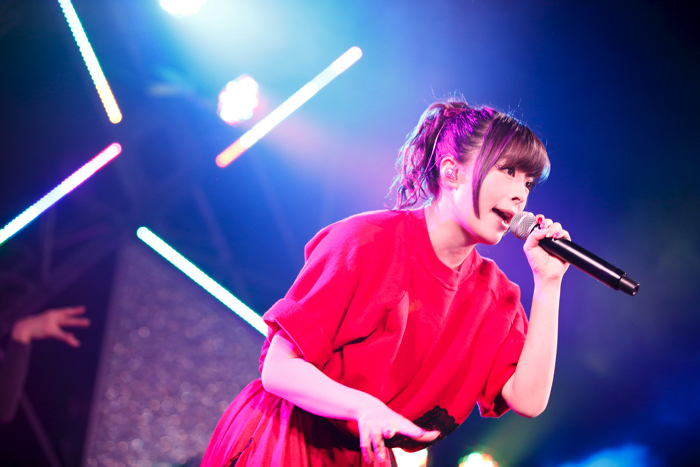 Kyary then appeared in front of a silver mic stand wearing a simple red one piece dress and with a ponytail. She first did a high-powered performance of her 2 songs, “Fashion Monster”and “Invader Invader.”The smooth dancing and the rapid succession of her songs set the floor on fire. During the first MC announcement it was revealed that this was Kyary’s first live performance at LIQUIDROOM. Being a live house, it was first suggested that she should come wearing just a T-shirt and shorts. However, this was rejected and in the end she appeared in her private one piece dress. 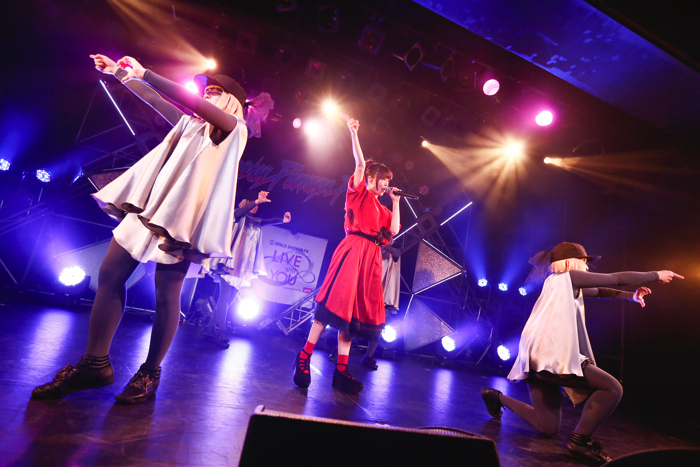 Kyary commented after her first songs, “I’ve never performed so close to my audience in a live house like this, so let’s become one and really enjoy ourselves!”and then she sailed into her all popular songs, “Ninjari Ban Ban” and “Mondai Girl.”Next, after commenting, “This is a live house, so I’ll sing this old song of mine!”she began to sing “Serious Hitomi,”a song on her album and a song very popular among her fans. The climax of her first set was “Kira Kira Killer” and then into her next set she performed “CANDY CANDY” and “Tsukema Tsukeru.” She kept the heat on and left no time for the audience floor cool down. “I went with the flow for a while!”she explained, to which the audience had a big laugh. 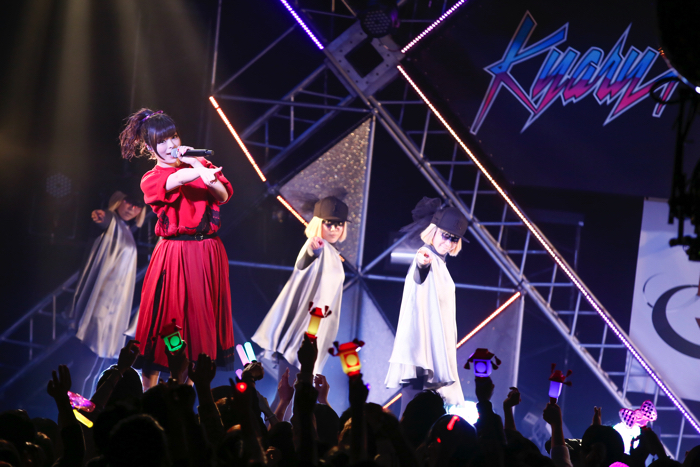 In this live, Kyary’s staging and clothing was very simple so the audience was able to enjoy Kyary’s performance and MCing from a very close range. She is not only “Kawaii”(cute) and extraordinary but she proved herself to be a excellent entertainer. This was a live performance where the audience experienced the charms of Kyary Pamyu Pamyu through body and soul. This live performance can be aired on Space Shower TV on March 31 (Sat.) 21:30. Mark this date and be sure not to miss it. SPACE SHOWER TV “LIVE with YOU” ~Kyary Pamyu Pamyu~supported by uP!! !